A year into our business we’ve done 12 guest podcast interviews with another 4 scheduled over the coming months. Here’s how we did it. As part of our marketing strategy at Bean Ninjas we focus on sharing content both on and off our website. Since I personally prefer speaking to writing, I decided that podcast interviews would be the most effective way for me to interact and engage with our current and potential clients. After launching Bean Ninjas I tried for months to get interviewed on a podcast with zero success. Now a year later we’ve had 12 podcast interviews and have another 4 scheduled over the coming months. Our road to guest podcasting has been a little bumpy, but along the way we’ve developed a replicable system that we hope you’ll find useful. First and foremost, to be a guest on a podcast you’re going to have to have an interesting story that’s relevant to the theme of the show and that’s something listeners can relate to. No matter how hard we try, bookkeeping just isn’t a topic that makes for a good podcast interview. What got us onto our first podcast, Zero to Scale was a recommendation from a previous guest who thought our business story would be a good fit. The theme of the podcast was from 0-$20k monthly recurring revenue (MRR) and we had just achieved our first milestone on our path to achieving $20k MRR. Note: the podcast theme has since been updated from $0-$100k MRR and beyond. Our second opportunity to guest podcast was on The Tropical MBA, where our story was again considered relevant as the the concept for Bean Ninjas was initially inspired by listening to a Tropical MBA episode. Our third guest spot was on the 7 Day Startup with Dan Norris. We initially launched Bean Ninjas in 7 days following Dan’s 7 Day Startup Method, so again, having a relevant story combined with the fact that we now had some street cred had him regard us as potentially interesting guests. In all three of these examples there was an element of our story that was compelling and relevant to the podcast theme or a particular episode topic, rather than us simply being asked on as experts and authorities in a particular field. When you’re a new business and you can’t rely on your expertise to land you a guest spot on a podcast, you need to be able to communicate a really good story. If you don’t have that, you may need to make changes in your business to create one. Ask yourself: What makes your business story interesting? How does your unique journey relate to the theme of the podcasts you would like to be a guest on? Next you’ll need to thoroughly research the podcast you’d like to be on. Listen to episodes, pay attention to the topics being covered and carefully profile their guests. Look at their previous guests and the businesses they represent to get a sense of how they might be comparable to you and your business. In my podcast research I discovered Gabby Wallace, a You-Tube guru offering a completely different product from Bean Ninjas but with a similar story to our own. I looked at what podcasts Gabby had been a guest on and began pitching to them, thinking that their listeners might appreciate our story as well. If a podcast is showcasing only heavy hitting guests such as Gary V, Neil Patel or Tony Robbins, it’s probably unlikely that you’ll be a good fit as a 1st or 2nd year entrepreneur. But don’t be discouraged. As you’re getting started, look for podcasts that are interviewing people and businesses with a similar path, story or theme to yours. Research their guests and explore the other podcasts those guests have been on as a way of deciding which ones you might like to approach. The research process can be time consuming, but as a business owner, I know that if someone approaches me with a well-researched proposal, that’s usually an indication of the overall quality of their work. If you put in the effort to understand a particular podcast audience and to articulate how your story will compliment the theme of that podcast, that will give the host a sense of how you’ll show up in an interview and suggests that you’ve done your due diligence. Thoroughly research the podcast, the hosts, the topics covered and the guests of the podcast you want to be on before pitching to them. Develop a clear sense of their listeners and the issues and topics they want to know more about. Do your best to communicate in your pitch how the story of you and your business will add value to their listeners. Schedule into your calendar at least an hour a week for podcast outreach and building relationships with podcast hosts. The hardest part is landing an interview on that very first podcast, but once you’ve been on one or two, when pitching to new podcasts you’ll be able to say, “I was on this similar podcast with this host and you can listen to the episode here.” That lends immediate credibility and gives the host a sense that you have an idea as to how podcasts work. Once you’ve got your story solid and you’ve researched the podcast you’d like to be a guest on, use a combination of leveraging your contacts, networking and writing a compelling pitch to land your first guest spot as soon as possible. Our first couple of guest podcast opportunities were all as a result of people we knew. After unsuccessfully trying cold email outreach I also posted in an online forum that we were looking for podcasts to be a guest on. This helped quite a bit to connect us with ideas and recommendations, but by far, the easiest method I’ve found for successfully getting on a podcast is to have people you know make an introduction. When pitching to a new podcast I use a basic email template, but I make sure to tailor it to the specific focus of their target audience and to the overall theme of the show. Leverage your network and ask for recommendations to get on your first podcast as soon as possible. Once you’re on, do your best to deliver exactly what they’re looking for, promote it well and from there the ball will have been set in motion. When you successfully land your first spot as a guest on a podcast it’s essential that you’re as prepared as possible. If you’ve never been interviewed on a podcast before, that first one can be a bit intimidating, but by going over your talking points in advance, possibly rehearsing with a coworker, friend or in the mirror, you can significantly minimize the stress. Make it easy for your host by sending them a list of potential talking points, some background information about you and your business and links to a few blog posts or articles you’ve written that might be relevant to the topic you’ll be discussing. Have a current bio and professional looking headshot ready to be included in their show notes and on their podcast website. Spend some time listening to a few episodes of the podcast as well as reviewing some transcripts in advance to get a clear sense of the podcast brand and the host’s interviewing style. Try and schedule interviews when you’ll be at your best. Personally, I prefer scheduling podcast interviews in the morning when I’m at the top of my game and I block out at least 30 minutes prior to the interview to read over my notes and clear my head without any other distractions. Double check your computer to make sure that it isn’t going to suddenly restart with updates in the middle of your interview and make sure that your internet connection is both fast and secure. After your interview, thank your host for the opportunity to have been a guest on his or her podcast and if you haven’t already done so, leave them a positive review on iTunes, Stitcher and Soundcloud. Podcast hosts rely on four factors to boost their rankings, which are determined by subscribers, downloads, ratings and reviews. The more positive reviews they receive, the higher the podcast ranks and the greater reach the podcast can have. So if you enjoy their podcast, leaving a positive review will go a long way in continuing to build your relationship with the host. Helping to promote the interview through your own network as much as possible once it’s been published will be greatly appreciated by the host, and if you know someone else who might be the perfect guest for that particular podcast, pay it forward by making an introduction. Prepare for your interview as much as possible by equipping the host with helpful information about you and your business. Familiarize yourself with the podcast brand and the host’s interviewing style. Set yourself up to win by scheduling your interview at a time when you’re at your best and make sure your space is quiet, your computer and internet are fully operational and your sound quality is top notch. After the interview, leave the podcast a positive review and if you know anyone who might be a great guest, make the appropriate introductions. Despite having been interviewed on 12 podcasts with 4 new shows scheduled for the near future, we have yet to be personally invited by a host to share our business story on their podcast. All of our success has come from leveraging our network, thoroughly researching our preferred podcasts and then sending solid pitches. Our next goal, and the ultimate goal for any business owner in the game of being interviewed as a guest is to get the call or the email from a host saying that they would love to have us on their show. With all of the progress we’ve made in the past year following the above method, we’re hoping that call is right around the corner. Once you’ve been on a few podcasts you’ve amassed a body of evidence that points to your credibility within your industry. Credibility leads to trust, trust leads to referrals and ultimately sales. The field of bookkeeping is a high trust industry and at Bean Ninjas we’ve discovered that if someone’s heard us interviewed on a podcast, they’re more inclined to work with us. As your business grows and you become more of an authority in your field, your story becomes more interesting. People want to learn from your experiences, your failures, your triumphs, hacks and solutions. Guest podcasting is a perfect way to share your story in a valuable way while simultaneously expanding the online presence of your business. It took us 4 months of actively seeking interviews and 9 months from the launch of Bean Ninjas to organise our first spot as guests on a podcast. So be patient! 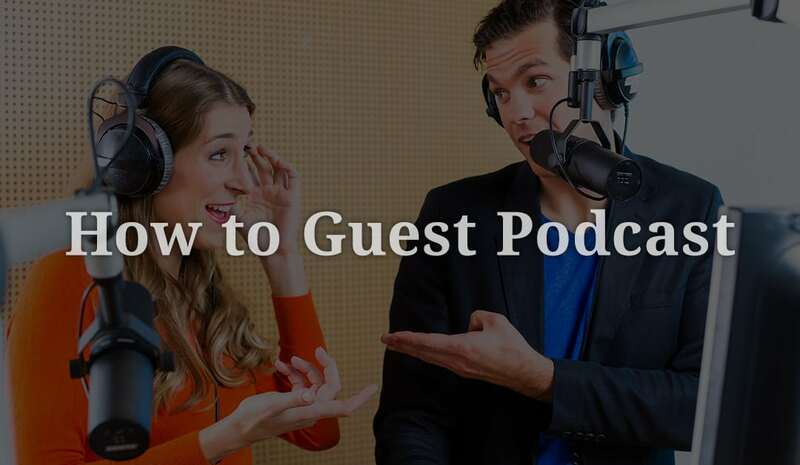 We hope that you found this information about guest podcasting helpful and that you now have a clearer understanding of how to approach getting your business a guest spot on a podcast as well. Best of luck.